We would like to start an important conversation about the rarely mentioned subject of Neuromuscular Junctions (NMJ), their critical role in the work of healthy muscles and in the development of hypertonic muscular abnormalities. Of course, we will discuss it from the Massage Therapy (MT) perspective. Generally speaking, our body is an independently functioning and highly efficient electrical machine. Everything is an electrical event – the brain produces electric waves, receptors generate action potentials, electricity allows muscle contractions to happen, bones generate their own piezoelectrical potentials during exercise, cardiac muscle contractions and relaxations are electrical events, blood flow along the walls of arteries triggers streaming potentials, etc. However, there are special places in our bodies which are unique. In these areas electrical impulses are conducted from the CNS to skeletal muscles and transferred from one type of tissue (nerves) to a completely different one (muscles) and after that electrical impulses spread further through the entire muscle triggering its contraction. Since nerves and muscles are different in anatomy, physiology and functions, their communications require a middle man and these middle men are called NMJs. Fig. 1 illustrates the typical structure of NMJ. Fig. 2 illustrates NMJ in the skeletal muscle. The function of NMJ is a complicated chain of events and it is easier to understand and follow this process with great video developed by Pearson Education. In this video major events that happen in NMJ are presented in 7 steps. For our further discussion we would like to add that these 7 steps can be split in three parts. While watching the video please keeping it in mind. A lot of pathological events can affect the function of NMJs. There is even a group of diseases called NMJ Disorders. However, abnormalities in the function of NMJs which are responsible for the muscle tension area are an especially interesting subject for practitioners who practice somatic rehabilitation. As you saw in the video, for every muscle contraction to happen the Acetylcholine (ACh) must be released into the synaptic cleft. Thus, this neurotransmitter serves as a messenger between nerve and muscle and only after its release from the nerve terminal and binding to the end plate of the muscle has the contraction happened. ACh removal or its disintegration equals muscle relaxation. 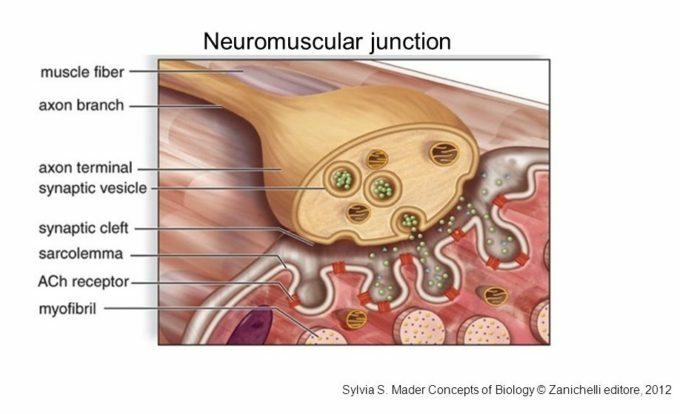 Now let’s look at what happens in NMJ after each major muscle contraction while the muscle is supposed to be in a completely relaxed state. We don’t know exactly why, but ACh, even during relaxation of the muscle, can be spontaneously released from the nerve terminal, i.e. without command from the CNS (Thesleff, 1988; Sellin et al., 1996). Normally this ACh leakage is small and it doesn’t trigger full muscle contraction, but rather produces miniature end plate potentials called Postsynaptic Noise and this noise can be registered by recording equipment in a completely relaxed muscle. Fig. 3a illustrates the presence of low voltage end plate potentials in the relaxed latissimus dorsi muscle of a cat (Wray, 1981). For many reasons (age, level of muscle activity, irritation of the nerves, etc.) 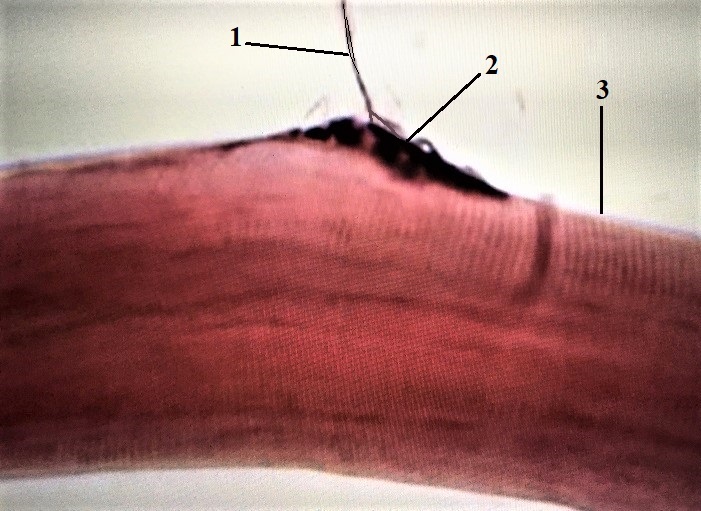 the ACh leakage from the nerve terminal significantly increases and it triggers a rise in the voltage of end plate potentials generated within the muscle. Despite that these potentials are still not strong enough to trigger full muscle contractions, they instead trigger an increase of the resting muscle tone. Fig. 3b illustrates the size of end plate potentials after increase in spontaneous release of ACh from the nerve terminal registered in the latissimus dorsi muscle of the cat. Compare the size of post-synaptic noise between Fig. 3a and 3b. Each muscle has resting muscle tone even in a completely relaxed state. This normal tension will disappear only if the motor nerve which supports the muscle is completely cut. However, increase in resting muscle tone has a dramatic impact on the muscle function and it eventually becomes the initial trigger in the formation of hypertonic muscular abnormalities in the form of hypertonus, trigger point and eventually myogelosis. The simple example of increase in resting muscle tone is stiffness and mild muscle pain and tension in the morning some people complain about. They don’t have these sensations during the rest of the day, but only in the mornings. So why does the increase in resting muscle tone play such a critical role in the muscle function? Everything comes back to circulation and oxygenation of the muscle tissue. During the night muscles are at rest and absence of their contractions deactivates so called muscle pump, which during the day helps to maintain normal blood perfusion through the muscles. Muscle pump assists the cardiac function by additionally sucking the oxygenated blood into the muscle and pushing the venous blood out, back into circulation. If, the muscle is healthy, the blood pressure generated by the heart during resting hours is enough to overcome the absence of muscle pump actions and enough oxygen is delivered to the muscle during the resting hours. The situation changes dramatically if resting muscle tone (e.g. as a result of increased ACh leakage) even slightly rises and now cardiac function (i.e., blood pressure) alone can’t overcome newly formed resistance to the blood flow that the muscle now exhibits. Lower oxygenation changes local pH (lowers it) in the muscle and it also decreases ATP production and storage which is major energy source used for muscle contractions and relaxations. As soon as the patient wakes up and starts to move around, takes a hot shower, etc. the muscle pump kicks in and it restores and maintains local circulation, assisting the cardiac function, until the same events happen again at night and the following morning. Eventually the increase of the resting muscle tone with a simultaneous decrease of circulation and lower oxygenation at night become the first stepping stones in the formation of hypertonic muscular abnormalities. We now know that the spontaneous leakage of ACh from nerve terminals triggers increase in resting muscle tone by magnifying end plate potentials (see Fig. 2b). This is why this event becomes a very important issue for somatic therapists to understand how and why leakage happens and what can be done about it. Without these theoretical data applied into the clinical setting, the endless application of various methods and techniques which address trigger point themselves became an endless chase of one’s own tail. So why does AcH spontaneously leak from the nerve terminals into the synaptic cleft, activating stronger end plates potentials? Medical science doesn’t have defined answers to this question yet, but a very interesting theory exists and years of clinical observations in our clinics confirmed for us its validity. The original theory which tried to explain the nature of trigger points and other hypertonic muscular abnormalities emphasized that if trauma wasn’t the factor the active trigger points in the skeletal muscles have neurological nature or in other words they are signs of reflex zones formation (Shade, 1921; Mackenzie, 1923). This original theory was later substituted by dominating views that trigger points and other hypertonic abnormalities are simply local pathologies (Travel and Simons, 1983) and their therapy requires local therapy as well (e.g. Trigger Point Therapy). However, the local origin of the hypertonic muscular abnormalities failed to explain the presence of active trigger points in the skeletal muscles, located far away from the original source of pain and discomfort. For example, a patient with a herniated disk on the level of L5-S1 exhibits abundant active trigger points in the leg and foot muscles innervated by the L5 spinal nerve. Dr. Quinter (1994) was first among modern scientists who focused on the necessity to come back to the original theory and look on hypertonic muscular abnormalities from the neurological perspective. Initially his views were rejected by a majority of scientists, but recent studies confirmed that Dr. Shade, Dr. Mackenzie and now Dr. Quinter were right. Thus, if these ‘old/new’ views are correct they completely change the treatment dynamic which is currently used by somatic therapists around the world. From this perspective the therapists first must identify the presence of the initial neurological trigger to the formation of hypertonic muscular abnormalities and eliminate it while later combining therapy with local treatment – Trigger Point Therapy, for example. Let’s look at three possible scenarios from the perspective of local and neurological aspects of hypertonic muscular abnormalities using three scenarios of pain in the deltoid muscle as an example. Scenario 1. The patient with right side shoulder pain was examined and a positive Wartenbugr’s Test confirmed the irritation of the brachial plexus by the anterior scalene muscle. In this scenario, if the anterior scalene muscle even slightly irritates the peripheral nerve (as a part of brachial plexus) it will trigger formation of reflex zones in the deltoid muscle in the form of active trigger point(s). In early stages the patient doesn’t complain about any discomfort at the place of irritation (anterior neck), but instead to muscle pains, discomfort and decrease of ROM in the areas where the irritated nerve ends (shoulder joint). In this particular scenario it is the Axillary Nerve and its low-grade irritation by the anterior scalene muscle is the reason for the Deltoid Muscle Syndrome formed secondarily. One of the local mechanisms responsible for the clinical picture is the increase in the spontaneous ACh leakage due to the spasm in the deltoid muscle. Scenario 2. A healthy individual gradually developed active trigger points in the right deltoid muscle after an exercise program. There wasn’t any event he recalled when he felt acute pain during the exercise. It looks like the patient developed muscle pathology as a result of muscle overload. The Case of the Month in this issue of JMS submitted by Melissa Reynolds, CMMP, LMT is a great example of muscle overloading scenario. In this scenario the slow buildup of tension in the affected muscle also increased spontaneous ACh leakage. Scenario 3. A patient with an active trigger point in the right deltoid muscle felt initial pain in the right shoulder when he increased weight and tried to lift it in the gym. He remembers the exact event when he felt that something happened to his shoulder. In such case we were dealing with local pathology due to the deltoid muscle’s trauma. Despite that the acute trauma was the initial trigger, the protective muscle tension developed by the brain as a reaction to it will also increase spontaneous ACh leakage. In the first Scenario it is obvious that the active trigger point in the right deltoid muscle has strictly neurological origin and therapy must target the anterior neck to reduce tension in the anterior scalene muscle first to free part of the brachial plexus which later gives origin to the axillary nerve. In such case local therapy plays an important, but supportive role. In the second and third scenarios it looks like there is no neurological aspect to the clinical symptoms and local therapy will do the trick. However, this is not the case since the neurological aspect still plays an important role. It brings us back to the topic of this article – function and pathological changes in NMJs because the therapists must include the direct work on NMJ into the treatment protocol. However, in all three scenarios the increase in spontaneous ACh leakage is one of the underlying mechanisms of increased muscle tension. Let us now come back to the original question why spontaneous leak of ACh from the nerve terminal into the synaptic cleft increases the resting muscle tone. There are two major reasons: first is tension in the fascia which covers the muscle and second is the consequence of the first – an overall increase of resting muscle tone with a following increase of pressure within NMJ. Each skeletal muscle no matter how small, is innervated by a motor nerve which brings commands from the CNS in the form of action potentials. Each muscle is covered by fascia. The superficially and deeply located muscles are covered by superficial and deep fascia respectively. For the motor nerve to enter the muscle and form the NMJ it must penetrate fascia first. In the second or third scenario we discussed above, muscle tension developed as a result of acute trauma or gradual muscle overload will immediately trigger a brain reaction in the form of protective muscle tension. As a result of this tension the fascia will shorten, and it starts to slightly irritate the motor nerve BEFORE it forms NMJ. Such irritation will put the motor nerve in a so called hyper-irritability state where it will overreact to normal action potentials and release more ACh than needed, elevating resting muscle tone. This fascial tension in the place where the motor nerve penetrates fascia can be so bad that chronic low-grade inflammation there triggers extra collagen deposit which forms a so called collagen cuff around the motor nerve (Gogoleva, 2001). The same way compression of the sensory nerves by the tensed fascia is one of the leadingmechanisms responsible for Fibromyalgia development. This topic was raised several times during the recent 33rd NAMTPT Annual Conference in Chicago, which M. Biancalana reviewed in this issue of JMS. Increased fascial tension additionally compresses the NMJ and elevates pressure within the NMJ. This extra pressure within the NMJ becomes a critical force which triggers spontaneous leakage of ACh which in turn increases the resting muscle tone and with its prolonged presence eventually triggers formation of hypertonuses and active trigger points. In Scenario 1 the therapist should address the initial trigger which is to normalize the anterior scalene muscle first and free part of the brachial plexus which gives origin to the axillary nerve (that nerve innervates the deltoid muscle). As soon as tension in the anterior scalene muscle is normalized the therapist should start to address the local consequences of the axillary nerve irritation by working directly in the area of the NMJ. The final part of the session should address active TPs formed in the soft tissues. In Scenarios 2 and 3 working on the anterior neck is not a priority, but working first on the NMJ itself is. The therapist must normalize tension in the fascia over the entire muscle, but especially over the NMJ and later address the areas where active trigger points are located. To efficiently take pressure from the fascia the therapist may apply the following techniques or their combination: Connective Tissue Massage, Myofascial Release, Skin Rolling, Mobile Cupping (using minimal vacuum to prevent formation of ANY hematoma in the skin and fascia). To end this article, we would like to one more time emphasize the critical importance of work on NMJs which MUST be part of any somatic rehabilitation. If the therapist doesn’t address the NMJ during the treatment he or she runs a very high risk that hypertonic muscle abnormalities will return relatively quickly. We will dedicate Part II of this article towards clinical recommendations on how therapists can include working on NMJs. Quinter J.L., Cohen M.L. Referred pain of peripheral nerve origin: an alternative to the “myofascial pain” construct. Clin J Pain, Sep;10(3):243-51, 1994. Sellin LC, Molgó J, Törnquist K, Hansson B, Thesleff S. On the possible origin of giant or slow-rising miniature end-plate potentials at the neuromuscular junction. Pflugers Arch. 1996 Jan;431(3):325-34. Schade H. Untersuchungen in der Erkaltungstrade: III Uber den Rheumatismus, in besondere den Muskelrheumatismus (Myogelose). Munch Med Wschr 68, 95-99, 1921. Wray D. Prolonged exposure to acetylcholine: noise analysis and channel inactivation in cat latissimus muscle. J. Physiol., 1981 Jan; 310: 37–56.